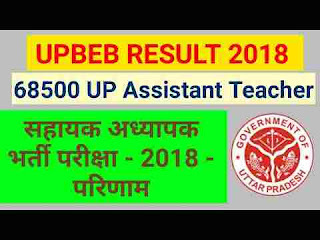 The UP Examination Regulatory Authority Allahabad has recently conducted the examination for the recruitment of 68500 Vacancy of Assistant teacher posts in UP. Today the UPBEB department issued a notification in which they launched the examination result. So those who appeared in this examination can check their result. This examination was held on 27th May 2018 in the various exam centres all over UP state. Under IMPORTANT LINK section below we share the direct link to check your exam result. All the best to all the participants under this Written examination. NOTE: You should have your ROLL NUMBER with you to check the examination result. 27TH May 2018 is the Exam Date.